You only need three ingredients to make banana pancakes. It’s flourless and gluten free. Nothing can be easier. The little bit of salt is to enhance the flavours of bananas. You can skip it though, ending up with only using two ingredients. This is another way of getting rid of the ripe bananas sitting on my bench top. The natural sweetness and fragrance of ripe bananas are the soul and spirit of the snack. They are best served hot straight from the pan. A side note, after I posted and shared this recipe on my Chinese fan page, I was glad that many readers tried and told me their babies liked this snack. Cut the bananas into smaller pieces. Place in a mixing bowl. Mash with a fork. It doesn’t matter if there’re still any small banana bits. Add in the eggs. Stir to combine thoroughly. Stir in the salt. It’s ready to cook up now. Heat oil in a non-stick pan over medium heat. Pour in about 2 tablespoons of the banana mixture. Reduce heat to medium-low. Cook until both sides are golden brown. Cover to keep warm. Continue to fry the remaining banana mixture. 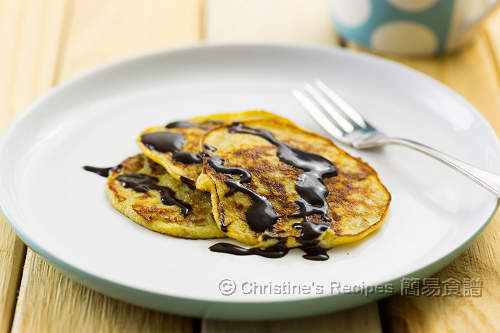 Drizzle chocolate sauce on top if desired. Serve hot. As there’s no flour added, the banana mixture is quite loose. When you cook the first side, make sure the middle is set before flipping over to the other side. Otherwise, it’d be easily torn apart. 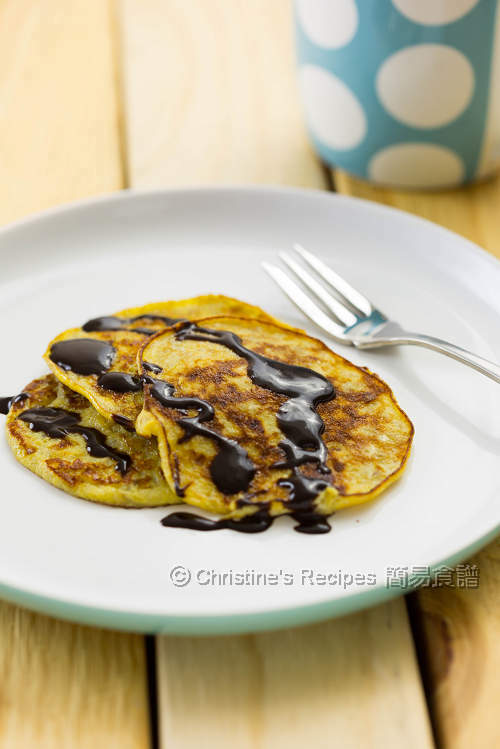 Having made two to three pancakes, you can start enjoying the snack while cooking the remaining mixture. 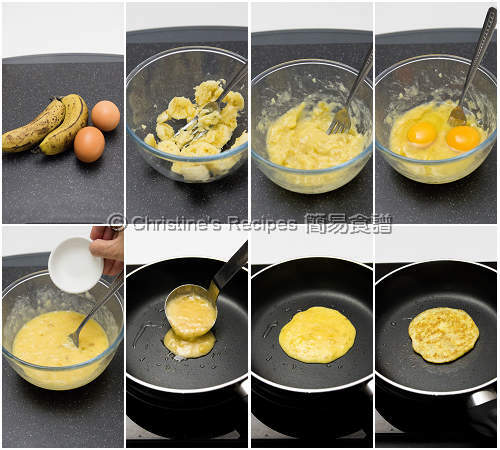 This is exactly how I made my banana pancakes :-)) Yours turned out much better than mine, Christine. You're a genius, Christine! What a great and simple idea! :) I always have leftover bananas and eggs. Love your recipes... is there anyway I can print them out to keep them in my recipes binder? There's a link of "printable recipe" above. You can print it out straight away. I tried to make these and they taste delish!! But it came out looning more like mush then pancakes haha. Still delish!! These pancakes are gluten free, no flour at all. These look great, so healthy. Can I use a blender to make a big batch and freeze it?